Sweet stories, songs and lapsit rhymes -- a playtime just for baby and caregiver! 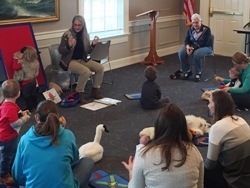 Mother Goose on the Loose incorporates nursery rhymes, music, and movement to aid in developing literacy skills and strengthening bonds between caregiver and child. It is most beneficial when children experience the program on a weekly basis. Mother Goose on the Loose lasts 15-20 minutes and is followed by creative play with puppets, books, and blocks. For kids from birth to three years old. Join us Friday mornings at 10:00 a.m.
Storytime and Mother Goose will not meet during the week of Wed 3/27/19 through Fri 3/29/19.